The wind just picked up. By the time I publish this I’m sure it will be raining, perhaps heavily, with strong wind gusts and a flurry of leaves whipping past the windows. Hurricane Sandy, the so called “Frankenstorm” (don’t get me started on how I feel about such a trivial name for something that has already killed and is still causing destruction at this moment) is bearing down on us. By the time it reaches us Southern Ontario it won’t be a hurricane anymore, but it will be a force to be reckoned with. During a huge wind storm in 2011 we were without power in our home for 50 hours. It was cold in here, but my husband was able to plug the fridge in to his work truck, and it wasn’t raining, so we cooked a rustic bread over a bonfire. This time around the weather is miserable. I really hope we don’t lose power. So what am I doing to prepare? Nothing, really. There isn’t much more that I can do to get ready for the storm. We have candles. We have food that we can eat without electricity. We have heavy blankets. Our basement, thankfully, is dry (unlike our last house, which had rivers flowing through the area where the cats slept). What I am doing is making bread. A lovely duo of sandwich loaves. Something about the smell of bread baking makes things feel cozy and comforting. I found a nice, simple recipe on The Kitchn. I’ve made it before and the family has raved about it. Today I tweaked it by adding some locally milled rye flour, and subbing honey for the sugar. I love how soft and easy to work with this dough is. Again, this dough works so easily that it’s simple to slit with a paring knife. With a storm bearing down, lighting isn’t optimal, even through my big kitchen window, but it’s pretty easy to see how nicely cut these are. Add the flours, reserving up to 1/2 cup of the all-purpose and mix until a shaggy dough forms. Either using a dough hook on your stand mixer or by hand, knead the dough until it’s smooth and elastic (about 10 minutes in a mixer). If the dough is quite sticky, add the reserved flour a tablespoon at a time until it’s not sticking, but is still slightly tacky. Clean out the mixing bowl and wipe it with a little oil. Turn the dough in the oil, cover it with a tea towel and let it rise until doubled in bulk, about an hour or so. Turn the dough onto a lightly floured surface and divide it into two. Shape each half into a loose ball and let them rest for about 10 minutes. If you need help with shaping, follow the wonderful instructions here for shaping your loaves. 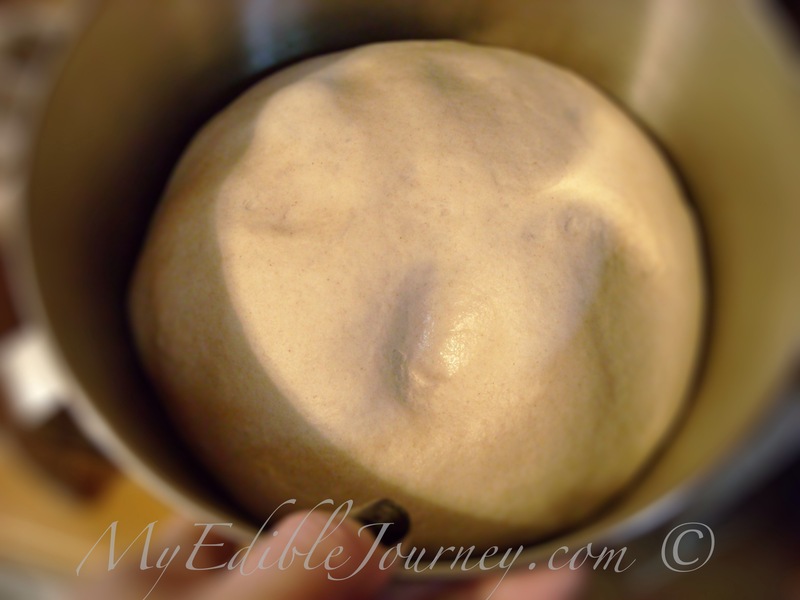 Place the shaped dough into two greased bread pans. Let the loaves rise a second time until they start to rise over the edge of the pan, 30-40 minutes (unless it’s a cool, damp day like it is here today, which makes the rise take longer). Preheat the oven to 425° F about halfway through the second rise. Slash the tops of the loaves with a knife and put them in the oven, and immediately knock it back to 375°F. Bake for 30-35 minutes. The finished loaves will be dark golden-brown and sound hollow when tapped on the bottom. Brush the tops of the warm bread with butter, if you like. I do. 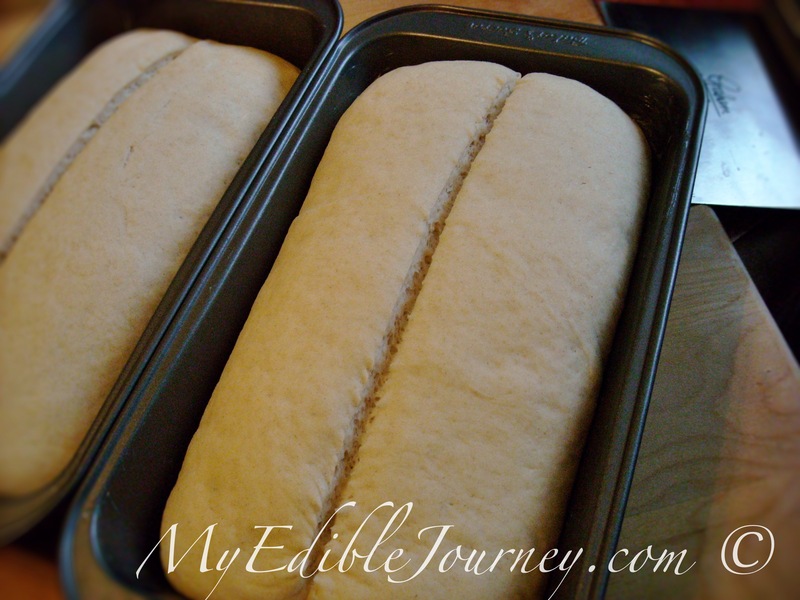 Remove the loaves from the pans and let them cool completely before slicing. This bread will keep at room temperature for several days, and the second one can also be wrapped well and frozen for up to three months. I bet this bread would be wonderful with peanut butter, which of course we don’t have. If you haven’t read about what I’m doing in honour of my turning 40 this year, check it out here. So far I’ve had a few jars pledged, and money wired to me from Qatar to buy some for the local food bank! Thank you to everyone who has tweeted or shared my post, and especially to those of you who have pledged to donate to your local food banks because of my goal. I intend to give the jars to our food bank during a Christmas food drive that a local radio station does each year, so there’s plenty of time to get on board. Oh look, there’s the rain…. 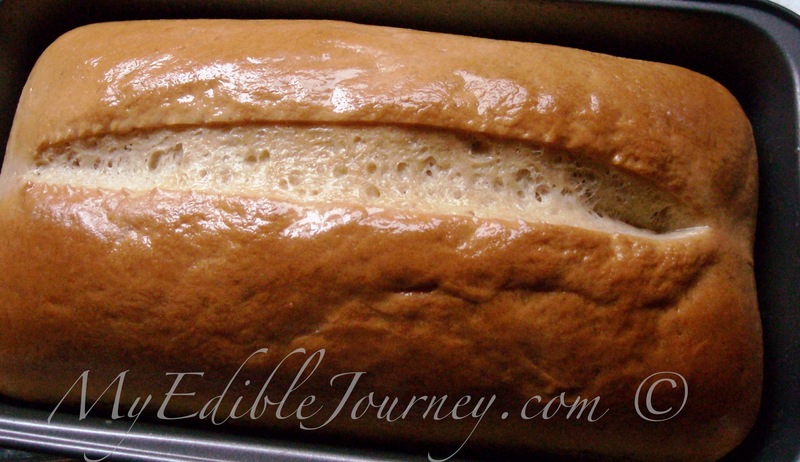 This entry was posted in Breads and tagged bread, peanut, rye, sandwich, storm on October 29, 2012 by Mama B.